At Boost we’re fortunate enough to be able to choose who we work with. Gavin, Culture Lead at Boost, often says “It’s the clients we don’t work with that define us”. It isn’t always easy saying no to work, but we always have good reasons behind these decisions. If sometimes turning down clients works for us, perhaps it could work for you. Here’s how and why we make our decisions when we’re choosing clients. 1. Is the customer committed to Agile? We see this as giving the project the greatest chance of succeeding. Every development project we undertake is Agile. This means that if the customer isn’t committed to Agile, they’re not the right fit. 2. Is their timeframe/budget flexible and realistic? Sometimes people come in with a misconception about how long their project will take or how much it will cost. This will seriously impact the relationship and outcome of the project. Quality applications and websites cannot be built for hundreds of dollars, or in a matter of days. 3. Are they focused on outcomes not features? It’s easy to list a bunch of features you think your users will want and need. It’s important to think about the outcomes you are trying to achieve, beyond the features you think are required. This gives the team flexibility to be innovative, and find ways to reach your outcomes that may be different from your preconceived ideas. 4. Is this project the basis for an ongoing relationship? We love it when customers achieve great outcomes and then come back for more! Clients see success working in an Agile way, and getting the most value out of their projects. This will typically bring them back for more next time they have a project or idea they want to explore, strengthening the relationship. We don’t want to be seen as just a vendor/supplier, we want to be partners. 5. Is the approach customer-centric? Has this been validated by end users? Finding ways to bring clients closer to their customers gets our wheels spinning. Creating something just because you think it’s going to be awesome (without any validation from people who would use it), not so much. 6. Is the project transactional, innovative or a technical stretch? We like to challenge ourselves and prefer complex and innovative projects. This keeps our team engaged, and that helps them produce the best possible results. 7. Does the client (and project) align with our Purpose, Vision, and Values? The TAB have come to Boost twice, once for development work and another time for Agile training. Both times we weighed the opportunity (a chance to do something fun, the opportunity to make the business some money) but it didn’t fall in line with ‘making New Zealand a better place’. Many of us enjoy a cheeky wager, but we also know the flip side — someone whose life has been influenced by gambling and the trouble it can bring when it gets out of control. Both times we had a team-wide discussion and talked through the pros and cons. Both times we decided it didn’t fit with our value of ‘making New Zealand a better place’, so we respectfully declined the opportunity to work with them. It’s important to understand that our values are not aspirational. We embody these every day in everything that we do; they’re not just words up on a wall somewhere. We’ve found that these values help provide the best level of success, and the positive impact we strive to have with the projects we undertake. What does Boost’s sales process look like? We attend sales meetings in pairs. Depending on the flavour of the meeting (development opportunity, or an Agile opportunity), I’ll take along one of the team who has expertise in that area. This means we can uncover what the clients are looking to achieve, and whether that’s something we are able to help them with. Business is about relationships, and the sales process is a key part of building and maintaining strong relationships. We love choosing clients who align with what we’re trying to achieve with Boost’s purpose and vision. That’s because we find that after a successful project is delivered they don’t hesitate to come back time and time again. With a number of our clients, we’ve worked with them for years, often on a range of different projects. 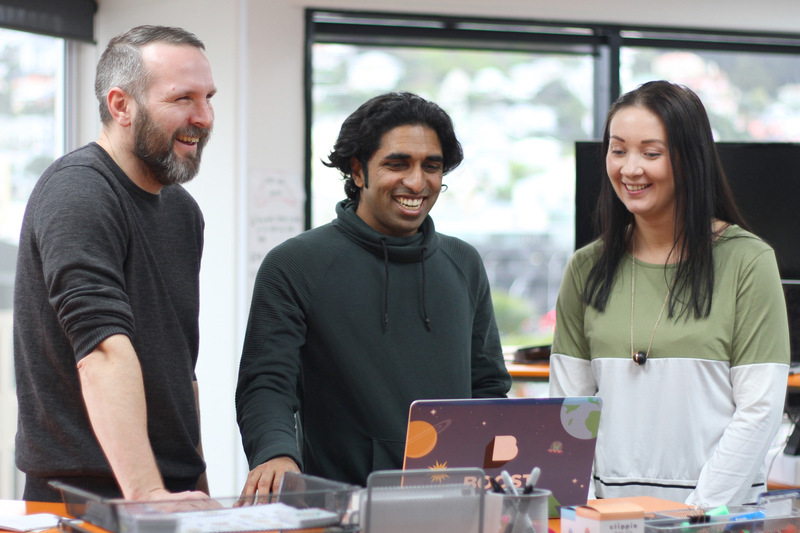 Our longest project, DigitalNZ, has been running for 11 years, and is still going strong. When we have a sales meeting we try to spend more time listening than talking. That’s because we’re trying to work out how we can best help potential customers, and how well aligned they are with our values. It’s the 80/20 rule – spend 80% of the meeting listening and 20% talking. We want to provide value at every step of the process, to provide solutions to their problems. If you ask the right questions — and most importantly listen!!! — then you can uncover all the information you need. We find out what the challenges and opportunities are for the client, and collaborate to find out how we can help them reach their outcomes together. One of the key things we need to find out is how much work has been done so far. Some project ideas have been refined and validated. Others are still in the ‘I’ve got a great idea’ phase, but the client doesn’t know if there is a market for what they are trying to create. It’s important that potential clients know a bit about Boost and how we work (our Agile development processes). This is because they need to understand and buy in to our approach. This means that, if we do partner on a project, then they know their role in the development process. This will help them understand the benefits this approach will bring. Benefits include delivering value (e.g. working software) frequently, transparency at all levels (budget updates, any issues or impediments the team face) and focusing on outcomes, rather than features and a predefined view of how the project should be completed. There are many ways to skin a cat. We leave it up to the team to decide how they carry out the work, provided they reach the outcome that the client has set. Choosing clients is not just up to me. While the ultimate decision is mine, we discuss opportunities together, run them through our qualifying matrix, and measure them against Boost’s values. It’s only after these processes that we decide to proceed. There are a lot of opportunities for us to disqualify a potential client/project. As a result, we’re spending the time on the right projects and clients. Another important factor to consider is that when we’ve agreed to size up a potential project and provide estimated costs and timeframes for a project, we involve the team in this step. It’s not accurate or valuable for the client to get an estimate from me, the salesman, as to how complex a project is, how long it should take, and what it will likely cost. I don’t carry out the work, our talented team do. So we bring them in to the conversation and have a developer and designer involved when we estimate the size of the work, and how long they expect it could take. It is imperative to outline that these are estimates. Due to the nature of how we work we have to be adaptable to changing requirements and prioritisation. By prioritising and working on the most valuable parts early, the client can get working software to test and refine the project. Why is this important? Making the right decision when choosing clients and projects will have a positive long-term benefit for your business, and for the projects themselves. Clients will come back for more if they have a successful, positive experience working with you. This helps grow the business and strengthen the relationships you build along the way. This can lead to clients referring you to other like-minded organisations. We’ve done work for clients in the past who we would not choose to work for again in the future. We’ve delivered successful outcomes, but along the way we’ve learnt that some organisations are not the right fit for Boost, and the way we work. Sometimes you won’t know until you try, but we’ve refined our processes to highlight these before projects start. Choosing clients helps you choose the work that is ultimately most rewarding. How choosing your clients helps you achieve your business purpose.